I don’t have a woodshop, you might say. And neither does the contractor you just hired. You know the one. He came recommended from a friend-of-a-friend, who didn’t do the really best job in the world, but would save you some money? He usually shows up at your house in an old station wagon or a beat up van leaking oil. He needs a temporary woodworking space so he chooses either your driveway, your basement or your attic. You’re sure he’ll make a half way decent effort in cleaning everything up. But, if he doesn’t, you won’t mind cleaning up after your bargain contractor because, after all, he’s saving you money. And the quality of his work will reflect the level of craftsmanship you got for your money. Unfortunately, if things don’t as expected, he’s usually hard to get in touch with. Contrast that with a quality contractor like Verne &Ellsworth Hann, who doesn’t bring a woodshop to your home because we have one at our shop at 2026 Lee Road in Cleveland Heights. 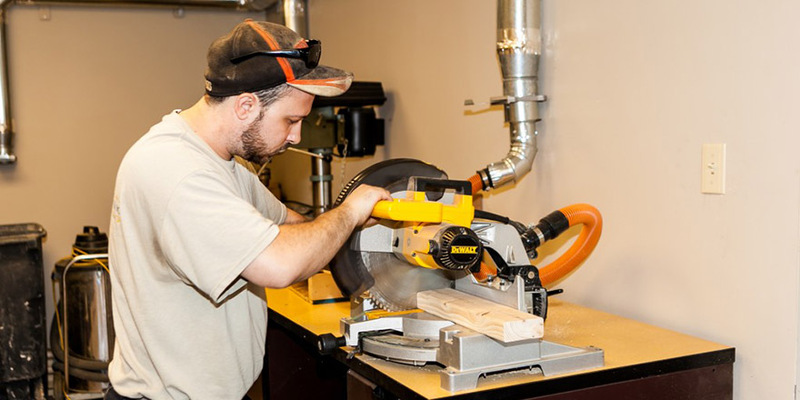 In the photo above is one of our technicians, Bryan, custom cutting some wood for a job on our 12″ compound miter saw. And the vehicle he drives to your home isn’t an old station wagon or beat up van that’s going to leave an oil stain on your new concrete driveway. And if the situation presents itself where we do have to use a power saw at the jobsite, all of our technicians carry shop vacs. We always carefully prepare our jobsite with drop cloths, cardboard and any protective moving blankets as needed. Every home is given the same amount of TLC as if it were our own home. And while it’s been often said that everyone’s home is their castle, there are times when Verne & Ellsworth Hann works in homes that are as elegant as homes built in Rhode Island or Europe. The homes that were built in the early 19th century in nearby Shaker Heights, Cleveland Heights and University Heights often had hands that learned their trade from old world craftsmen. We recognize the grandeur and elegance of these magnificent homes and treat them with respect they should be accorded. When we come to your home for a boiler installation, a new air conditioning system, or a new high velocity UNICO cooling system, we bring quality people and a dedication to craftsmanship to your home. We won’t be setting up shop. We won’t conscript you as an unpaid employee to clean up after us. What we will do is leave you with a “wow factor” that will make you want to tell your friends, neighbors and relatives about one of the best experiences you’ve ever had with a contractor. We’re a cut above the rest. 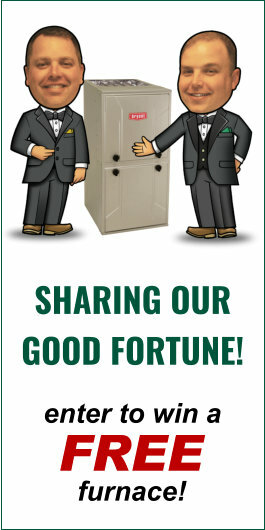 Find out for yourself by calling us at 216-932-9755. “All the king’s horses and all the king’s men can’t put the past together again. So let’s remember, don’t try to saw sawdust.” –Dale Carnegie.